Update: 2014-05-01 big news, win a free lab pass for Cisco Live US 2014; see the update at the bottom of this post! I went to Cisco Live US in Orlando last year. It was my first really big event, and the reasons for the fish-out-of-water comment are twofold. One is that I’m not, for the most part, a networking guy. I’ve done networking, mostly LAN/VPN and a bit of wireless, but I’m primarily a server sysadmin, bare metal all the way. And two, I learned my original network chops (beyond 10b2 Ethernet and dialup networking) supporting the Ethernet switching products division of Nortel up until the turn of the century. But two years ago last month, my boss asked, “Want to come to the datacenter in Vegas and work on some servers?” It was something to do, and I was curious how Cisco would make servers… so I went, and started loading cards into UCS C210 M2 servers and trying to get operating systems onto them. And for the last two years, a big part of my day job has been setting up, maintaining, deploying, and troubleshooting a pretty big pile of Cisco UCS C-series servers and related infrastructure. It’s been a wild ride, and it’s probably a relatively rare patch of expertise, and I’ve learned a lot via trial by fire (and a lot of dumb questions to my TME/savior). So last year, when I had the opportunity to go to Cisco Live (thanks to some help from Tech Field Day), I jumped at the chance. I stretched my trip home from Tech Field Day 9 in Austin to take me through Orlando and joined in a roundtable with Opengear while there, but mostly went around being a bit overwhelmed and meeting a lot of the people from Cisco who I’d worked with indirectly during the UCS adventure. I also met a lot of the people I interact with daily on Twitter , and some I just started interacting with at the event. There’s a few of them above this paragraph (and I think I’m in the middle of the right side near the back). I couldn’t get anyone to give me a ride out to Disney World, even with the promise of free passes, but it was a good time anyway. At some point as I was getting ready to leave for Orlando, I got a message on Twitter asking if I was interested in a new social media program Cisco was starting up. I was baffled but intrigued, and a month or two later I was one of the first dozen people in that program. So this year I’m headed back, an hour’s train ride away rather than 5 hours plane ride, with some lessons in my backpack and bigger plans for this year’s adventure. This year I’m going back as a Cisco Champion, with a couple of posts on the Cisco Perspectives blog and an even wider ring of social contacts in all corners of the Cisco ecosystem. I’m planning to head into the certification forest a bit (have to branch out somehow, right? ), and maybe show a bit more restraint as far as bringing tee shirts home (for the sake of domestic tranquility) . If you’re considering going, well, by all means check it out. There’s the main site for Cisco Live US, and a page describing the packages and options for registration. If your company does a lot of business with Cisco, check to see if they have learning credits available, or see if your organization has training or professional development budgets. If you’re local but on a tight budget (or if you can get to San Francisco cheaply anyway), consider Explorer ($49) or Explorer+ ($595) which give you access to the keynotes, the World Of Solutions vendor expo, and (with the plus) two tech sessions. Or there’s a social event pass for under $200 that lets you into the receptions, the expo, the keynotes, and the Wednesday night Customer Appreciation Event (likely a big concert and festival at AT&T Park or Treasure Island). If you can’t make it at all, check out the “Learn Online with Cisco Live” section of the above registration link. You can see a lot of sessions from past events, including one or two that you’ll hear me in the background of (with the speaker’s approval), and access to live broadcasts from time to time. And of course, follow the conversation on Twitter with the hashtag #CLUS and follow @CiscoLive (the official event Twitter account). If you’d like to read my observations and comparisons from VMworld 2013 and Cisco Live 2013, I conveniently have a blog post on those. 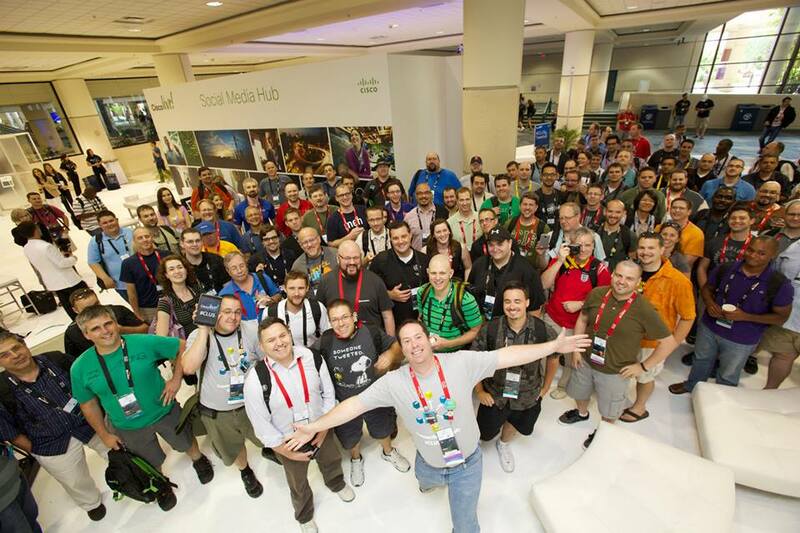 If you’d like to read Jeff Fry’s preview post on Cisco Live 2014, and you should… click on that link. The map of official hotels (some of which may be sold out of the CLUS discount block rates) is worth the price of clicking alone! It should be interesting to see how Cisco Live translates onto the Moscone conference space. While I won’t miss the humidity and 90-degree heat from Orlando, I will miss the $90 walking-distance hotel option. But I’ll be back, joining the social fray again, and looking forward to meeting as many of you as possible. And as a disclaimer, if you click on the Cisco Live links above, I get entered in a contest for a free lab or technical session at the event. Other than that, I get no compensation or consideration for this post beyond the warm fuzzies of supporting an event and team I like. I’ve been informed that I won the Cisco Live blogger contest for a free 4-hour lab or technical session at 2014’s Cisco Live conference May 18-21 in San Francisco. This is great news, and I’m grateful to everyone who helped me win by reading my posts and clicking through to the Cisco Live website. If you are already registered for a Full Conference pass for Cisco Live US 2014 in San Francisco, and can use a lab or technical session, just tweet a link to your favorite blog post of mine. Include the hashtags #CLUS and #RSTS11 in any order. Up to three tweets per person will be accepted as entries, so that the first tweeters to enter aren’t left out. However, if my timeline view shows more than one tweet in a row from you, that only counts as one. So tweeting an entry 25 times in a row is nice but won’t win you the prize. In honor of the 25th anniversary of Cisco Live, I will identify the 25th qualifying tweeter (with a link to a rsts11 blog post, and the two hashtags) and pass along your twitter handle to the Cisco Live team to arrange for your free lab or tech session. You might want to follow me (@gallifreyan) so I can DM congratulations and get your registered name to share with Cisco Live. Note that the 25th in chronological order at the time I look at the tweet stream will be chosen, and retweeted, deleted, multiple, delayed, or incomplete tweets may not be considered or eligible. Tweets before @ciscolive announces this win will be ineligible. Bacon not included. This is only for a 4-hour lab or technical session; you must already have a valid registration for the full conference pass itself to use this prize. Neither I nor Cisco Live is responsible if your head explodes from the learning experience itself either. This entry was posted in Events, Travel, Vendors and tagged cisco live, CLUS by rsts11. Bookmark the permalink. Looking forward to meeting you there Robert. Same here. I’ll be a frequent denizen of the social media hub/lounge area. And doing two labs. Aieee.